Christmas trees are to be used to help preserve a Merseyside beauty spot. The real tress are to be used to help develop the sand dunes around Formby Point after the festive season. Sections of the dunes have been eroding for 100 years, but experts believe the situation could get worse if climate change brings about rising sea levels. The trees help trap sand to build up the dunes in height. It is one of a number of methods being tested for long-term management of the dunes. Graham Lymbery, from Sefton's coastal defence team, said: "If you visit the coast at Lifeboat Road in Formby, you can see Christmas trees from previous years and other work that is being done. 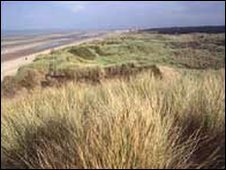 "Once the sand is built up we can then plant marram grass to keep it in place and encourage more sand to be deposited, allowing the sand dunes to work naturally as a valued habitat and coastal defence."